A fact file on the deadly Ebola virus, a new outbreak of which has killed 17 people in the northwest Democratic Republic of Congo, according to the DRC government and World Health Organization (WHO). Ebola — formally known as Ebola virus disease, or EVD — is a severe and often lethal viral disease. Ebola was first identified in 1976 by a team led by a young Belgian microbiologist, Peter Piot, who later founded UNAIDS, the United Nations’ spearhead agency against HIV/AIDS. They named the virus after a river in the Democratic Republic of Congo — then known as Zaire — that was close to the location of the first known outbreak. Four of the virus species are known to cause disease in humans — Zaire, Sudan, Bundibugyo and Tai Forest. The virus’ natural reservoir animal is probably the bat, which does not itself fall ill, but can pass the microbe on to humans who hunt it for food. Among humans, the commonest form of infection is through close contact with the blood, body fluids, secretions or organs of someone who is sick with Ebola or has recently died — a risk in African cultures where relatives typically touch the body of the deceased at funerals. Those infected do not become contagious until symptoms appear — something that happens after an incubation period of between two and 21 days. Given the lack of a pharmaceutical weapon against Ebola, health experts have responded with time-honored measures of control, prevention, and containment. 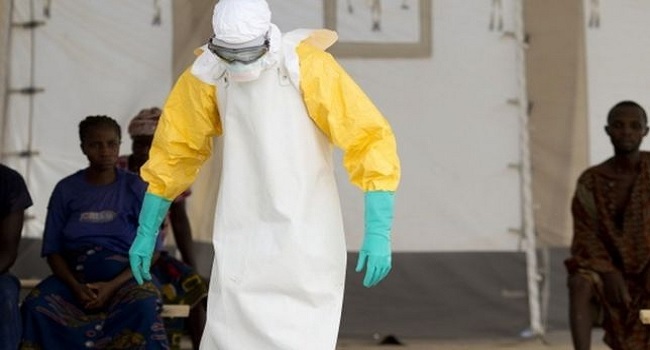 The world’s worst Ebola outbreak started in December 2013 in southern Guinea before spreading to two neighbouring West African countries, Liberia and Sierra Leone. That outbreak killed more than 11,300 people out of nearly 29,000 registered cases, according to World Health Organisation estimates. More than 99 percent of victims were in Liberia, Guine, and Sierra Leone although cases popped up all over the world, sparking panic. SOURCES: WHO, US Centers for Disease Control and Prevention (CDC).